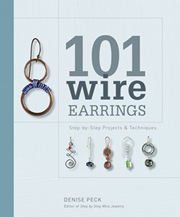 Join Beading Daily for its first earring swap and help us celebrate Denise Peck's new book, 101 Wire Earrings. Create a pair of handmade earrings, send them in with your self-addressed stamped envelope, and receive another pair of handmade earrings from another Beading Daily member in return. Denise has agreed to donate 5 pairs of earrings from her new book, so the earrings you receive in the swap may be one of hers! Swap begins July 24, 2009 and ends August 31, 2009. 1. Create one pair of earrings using any technique. Please send only your best work. Only one swap entry per person. 2. Place your earrings inside a small bag and label with your name and email address or website. Please print or type clearly or use a business card. This information will be sent to the person who receives your earrings. 3. Fill out the earring swap entry form completely and include it with your earrings, along with a 1st class padded self-addressed stamped envelope (SASE). 5. No book purchase required. Download and print the earring swap entry form to include with your package. Note: By submitting your earrings to our swap, you are authorizing Interweave Press LLC to publish photos of your earrings in upcoming publications and promotional materials, on our website, and in other Interweave e-media, as well as possibly display them in shows. Interweave Press LLC will not be held responsible for loss or damage due to circumstances beyond our control. Thank you for your tremendous interest and feedback to our announcement last week about our community’s first earring swap. We are deeply sorry for any confusion and frustration we caused about the process and rules, in particular the $5 handling fee that was incorrectly called an “entry fee.” In the past, Interweave swaps (such as the ATC swaps done in the quilting group) have required fees to pay for the handling of entries, such as the hiring of temporary staffing, to help process the thousands of projects that must be opened, repackaged, and exchanged. However, nothing is more important to us than making this a positive and fun experience for all of the Beading Daily community—and in this economy as easy on the pocketbook as possible—so we are happy to announce that we are removing the handling fee for this swap. If you already sent us a check, it will be returned to you. The only item you need to send in addition to your earrings is the self-addressed-stamped-envelope (SASE). • If you have allergies, please make a note on the outside of your self-addressed stamped envelope. Entries marked this way will be swapped among this smaller subset. • If Interweave is interested in publishing the design instructions for your earrings, you will be contacted and paid the standard designer fee given to designers who are published in Beadwork, Stringing, Step by Steps Beads, or Step by Step Wire Jewelry magazines. You always have the right of refusal and are not required to accept any offer of publication. We would like to thank you for helping us to improve our process for our first earring swap—it’s been a learning process for us too! Please don’t hesitate to contact us if you have further questions or concerns.